Born and raised in Bombay, I grew up in a classic ‘Bhel Puri’ culture. One in which the end product tastes only as good as the sum of its parts… meshed together with a bug or two for good measure. So here I am – a compound of experiences that somehow made its way to San Francisco, then to Hong Kong before returning back to San Francisco, with a pit stop in Tokyo somewhere along the way. A superiority complex about my Bambaiya Hindi coupled with feisty Punjabi genetics have stood me in good stead as I traverse the continents before looking to settle back home. Aside from focusing on the health of a husband, two youngsters with equally feisty Punjabi genes and my eternally faithful dog, Dumbledore, I dedicate my spare time to diverse activities like writing about the dysfunctional nature of life and living, stand-up comedy and of course my day job. I have written a series of books on Ayurveda, a personal finance book for Indian women which I am happy to report is available in English and Marathi, and two YA novels, my personal faves! I can’t exactly remember when I developed a passion for Ayurveda, India’s ancient lifestyle medicine. As an Ayurveda Clinician, it has become an integral part of my blood and no amount of leech therapy provides any relief. In my early American life, I founded, built and subsequently sold Ayoma, an Ayurvedic self care product line and the Ayoma LifeSpa, a premier Ayurvedic wellness spa. I have provided Ayurvedic spa therapy training to top spa wellness retreats like the Four Seasons, Champneys and the Canyon Ranch, and have taught clinical and CME programs to health care practitioners at the University of California San Francisco, University of California at Davis and University of North Carolina’s Global Medical Education center, and yoga teachers in Hong Kong and USA. Over the years, I have also spent a huge amount of time teaching lay people about the wonders of this medicine. 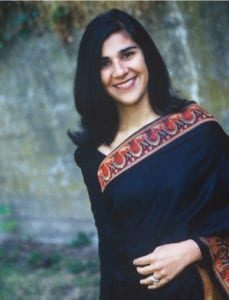 And beyond Reenita the Ayurveda clinician and author, there’s also Reenita the on-air personality, blogger, writer and producer. Some of my favorite moments were spent preparing award-winning shows for Asian Threads on RTHK Radio 3 and stimulating financial news audiences with Money For Nothing on RTHK Radio 3 and Daybreak Asia on Bloomberg Radio. Or producing content for a range of media outlets like the Wall Street Journal, New York Times, CNN, South China Morning PostAsian Investor, Times of India, Highlights for Children and National Geographic Kids, Cartoon Network Asia and Disney. My latest incarnation has transitioned me from a long standing career in broadcasting, journalism and content production, to supervising content strategy and operations for Otto Radio, a tech company in the audio media space. Yet another outlet for creative story-telling. But since Bhel Puri only intensifies with complexity, I unleash my inner creativity through a variety of story forms….come tap my storehouse, I have many tales to tell!